Painful vote counts under RCV? Outcomes used to offset the headache. PR was [the Plan E/PR charter’s] main weakness. 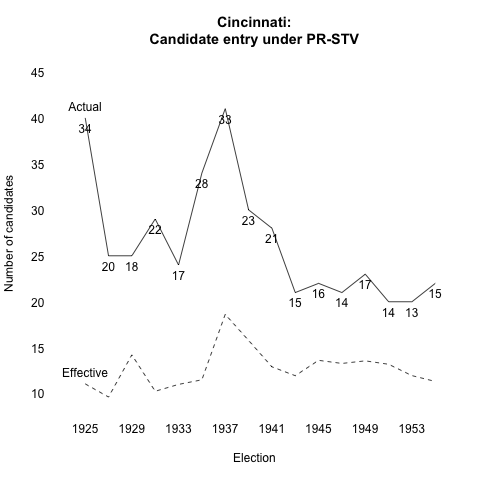 After that first tumultuous election in 1949, interest waned, the number of candidates dropped steadily and voters showed a growing impatience with the long vote counts. 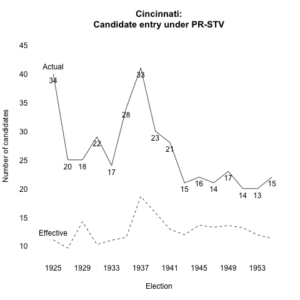 Southwick notes that candidate entry came drastically downward after that first election in 1949, so it can’t be that vote counts caused PR’s repeal. Leon Weaver suggested 30 years ago that the “complicated count” was one of many rhetorical devices used in repeal efforts. 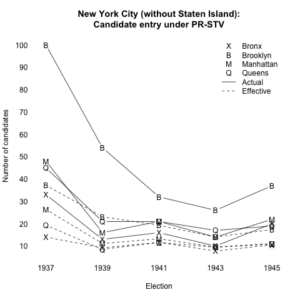 It’s true that local newspaper editors came to dislike PR by 1960, but this wasn’t due to the counting process. Elsewhere I show that reformist Democrats lost control of the city council median in 1960. This explains the newspaper’s position since the newspaper supported reformist Democrats. 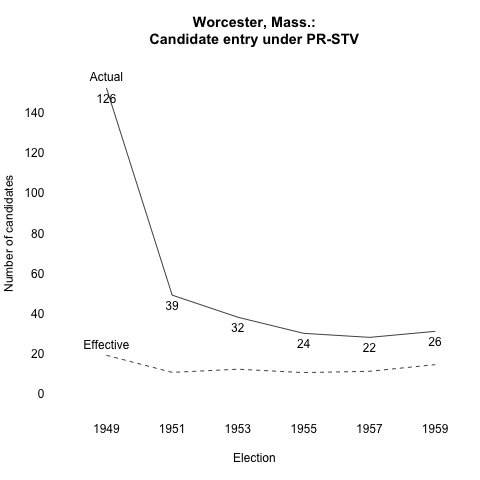 Data from Worcester show how vote counts got easier after 1949. The solid trend is the number of candidates on the ballot. (I have included the effective number of candidates for readers interested in “meaningful” candidate entry and/or party competition.) Numbers below this trend indicate the number of RCV counting rounds needed to fill all nine seats in the council. 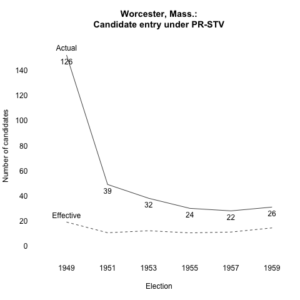 The slight uptick in 1959 is likely from tension in the local party system — in other words, the actual conditions that produce a repeal — but still below the 1949 level or even the 32 who ran in 1953, which Southwick cites as another frustrating count for reporters. We can repeat the exercise for Cincinnati, which also had a nine-seat council. Again, vote counts were relatively easy by the end of PR. What about that spike in 1937? As it turns out, a repeal campaign in 1939 is the only one of five I cannot predict from roll-call voting. Maybe the spike explains it, but it didn’t win. Just for good measure, here are the figures for New York City. 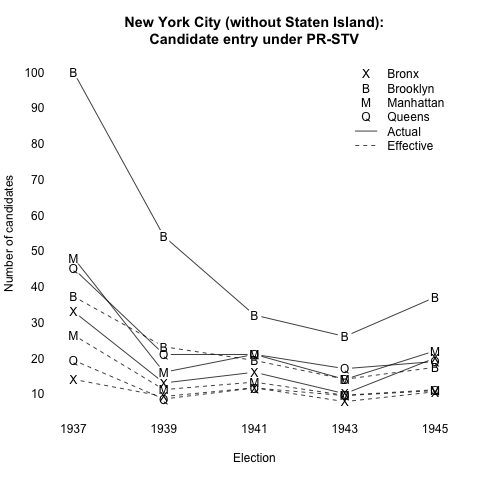 I exclude Staten Island, which is an outlier on district magnitude, candidate entry, et cetera. For reasons of space, this plot doesn’t include the numbers of counting rounds, but you can get a sense from the numbers of candidates. No, painful vote counts do not explain successful opposition to proportional representation (or RCV). Vote counts are a non-issue anyway since computers can do all the work. IBM had developed a PR counting machine by the mid-1930s, but this didn’t save PR in New York City. Cambridge, Mass. has been counting PR elections by computer since the 1990s. Check out Jeff O’Neill’s OpaVote project for more information on computerized counting.